Legend of Kay Anniversary is the remastered version of 2005’s Legend of Kay. Taking place on the island on Yenching, there are 4 races, each with their own villages: the rabbits, cats, frogs, and pandas. The island believed in “The Way”, or the inherent goodness in life and in other beings. In the present day, the gorillas and rats have invaded and conquered the island. You take control of Kay, a young cat who is a martial arts student. Angered by the shutting down of the martial arts school he was studying at, he sets out on an adventure to reclaim Yenching. 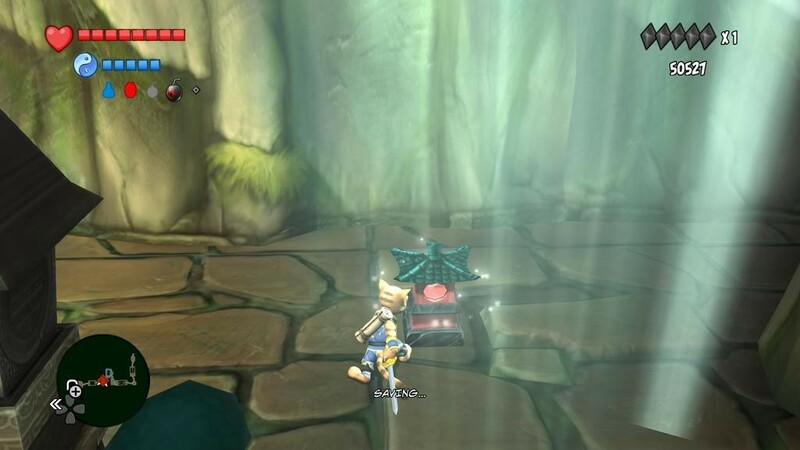 While it may not be as big as other action-adventure titles that spawned on the early 2000s for PlayStation 2 like the Jak and Daxter, Sly Cooper, or Ratchet and Clank series, Kay does have a few things going for itself. The gameplay was the high part of Legend of Kay Anniversary. The combat is amazingly fun, with a variety of combos you’ll have to perfect in order to play the game efficiently. Simply button mashing won’t really get you too far. Swords, claws, and hammers are the 3 main physical weapons you’ll get to use, with magic and a selection of items like bombs and potions being a factor as well. Puzzles also play a part in the game, and my one tip would be to pay attention to your surroundings, and to the dialogue (I spent a good 30 minutes running around the map before I realized there was a wall I could blow up with a bomb to get to the next area). The game doesn’t do as much hand holding as you’d expect. There are mission/quest markers but only if you’re on the right part of the map, which means you’ll have to do some exploring. If you’re bad at keeping track of where you’ve already been (like me), this means you’ll be spending some time running into areas you’ve already explored, but it’s definitely refreshing, not being given everything to ensure your victory. There are lanterns scattered throughout levels that saves your file (you can’t manually save). Simply running by will save your game, so you don’t have to find one and pull up a save menu, which is nice. My one complaint however, is the camera control. It doesn’t allow me to pan upwards as much as I’d like, making some angles really weird to play in. The graphics are nice to look at and is probably as good as it gets for a remastered version of a game that came out in 2005. The characters definitely look smooth and could possibly even pass for a modern game, but looking at the terrain, like the grass and trees make it a bit more obvious that it was an old game. One of my favorite parts about the graphics in Legend of Kay Anniversary is the way the enemy’s armor slowly breaks off over time. I was fighting one of the earlier bosses, an armored bear and every so often, I saw pieces of silver flying whenever he was struck. It took me a second to realize that those were pieces of his armor popping off. It made the combat even more satisfying. Parts of the cut scenes play out in gorgeous hand drawn motion comics which are absolutely stunning to look at. The music is okay. The island of Yenching is meant to be representative of an Asiatic culture (Chinese, judging by the characters written throughout the game) so the music takes on the appropriate tone. The voice acting however, is one of the lowest points of the game. Most of the characters sound like they’re reading their lines off of a script, and I rarely felt convinced by the emotions they were trying to portray. Races like the rats and gorillas have their own distinct voices, with the gorillas having a deep tone, while rats sound more squeaky, but it all falls flat. The judgement may be a bit harsh, as the original game came out a decade ago, and the voice acting was a pretty big complaint back then too. Lines like “Scum sucking cheesebreath” is just laughably bad. Either way, I had to lower the ingame voices, as it was starting to bug me. Legend of Kay Anniversary is a pretty solid game. Having never played the original, I was still able to play the remastered game with enjoyment. While remastered games often rely on nostalgic gamers for purchases, I think Legend of Kay could potentially pull off a sequel (with better voice acting hopefully). Anniversary could definitely pull in a new generation of players and kick off a franchise. At $30 or under, depending on your console of choice, you’ll definitely at least get your money’s worth.